Note to self….no more napping. I managed to ‘cat nap’ most of the night; was wide awake at 6:15. I could tell that it was going to be a sunny day. An older, smaller ship (The Athena) was just being positioned next to the dock by one of the tugs. And within a few minutes, here came the Century. It wasn’t long before I heard loud music coming from somewhere outside. I went aft & found a 3 piece Aussie band playing on the upper deck of the cruise terminal. If I had been sleeping on the port side of the ship, I would have certainly been pissed. I requested room service breakfast at 7:15; yogurt & granola & a piece of toast; grape juice & milk. A little something to tide me over during the morning tour. Australia is VERY strict about taking any type of food from the ship ashore. They inspect every bag & take away what they find. By 7:30, the film crew was circling the ship in a (obviously rented) news helicopter. At least they finally had a sunny backdrop to shoot the ship. When we gathered in the Stardust Lounge prior to our tour departure, I learned that my two bridge partners (Louise & “Mr” Kim) were on the same tour (ADL-AW, Panorama city tour). I sat next to a ‘mature’ woman who had signed up for the fighter jet excursion. She is my idol. I would have been brave enough to do it; but the $2,435 tour ticket, was way outside of my budget. An elite group of 3 passengers got the chance to experience combat maneuvers (wing over, loop, barrel roll & a stall turn) all while pulling up to 4 G’s. She told me her grandkids thought she was pretty cool for doing this. I hope I run into her again to find out all about it. The panoramic tour had enough people to fill 3 buses. I chose bus #3; & was able to get the back row all to myself. It was escorted by Jim (Ambassador Host); the guide was Paul & the driver was Kelly. Strangely enough, Paul is not a normal guide with historical knowledge; his specialty is the wine country tours. How we ended up with him, I’ll never know; but he had his own comical way of describing the passing scenery. Kelly (my first female bus driver) filled in with commentary when Paul drew a blank. They made a cute ‘tag team’. It was an ideal day for a little walking; bright blue skies, lower humidity, no haze in the air & temps in the low to mid 60’s. School kids refer to these as 'crayons'; when in fact they are safety barriers at a curve on a busy highway. Not sure if they were meant to mimic the shape of the cypress trees, but they are works of art nonetheless. One tidbit of info that I picked up from Kelly…….modeling the city after the great cities of England, the founding fathers wanted it to be a city of churches & parkland. The city’s many parks not only provide an oasis for city dwellers; but they also help control carbon emissions. Our visit here was on a Sunday, which brought tons of people outdoors. But we were told it would look nearly the same midweek. We wound our way in a zigzag pattern across the city, climbing in altitude little by little. The architecture here was more traditionally English. The average home, although expensive ($300-400,000 AUSD), looks ‘average’. The more modern midrise buildings closer to the beach were at least triple that cost. We passed many lovely churches; & our big photo stop was at the Mount Lofty Summit (where I happened to run into Celeste & Bill, who were on a different tour). The view of the city & the Gulf of St. Vincent was spectacular. However, I was disappointed that the ‘grid system’ on which the city was designed was not clearly visible. It was just too far away; or maybe we just needed a higher vantage point. We wended our way back down to sea level & another stop at a beautiful beach community called Glenelg (notice, it would be spelled the same forward & backward). We had time to wander around the children’s park, walk on the beach, have a coffee or ice cream in the sidewalk cafes. The temperatures were close to 70; & it was just a delightful day to be outdoors. I just had to take my shoes off & walk in the soft grass; the way grass used to feel when I was growing up in TN. Back on the bus & heading into the city center, we made a stop at the Rundle Mall area to drop off those who wanted to stay in town to shop. Due to the distance between the port & town (approx. 35 mins), Crystal was offering regular shuttle bus service back & forth. It was on this final part of the tour, that my good camera ‘died’ again. When I power up, the lens will not come out of the body. I tried the ‘toothpick’ method again; no go. It’s time to start thinking about options. You would think Crystal advertises on billboards in Australia. FYI, onboard promotional materials tout "Crystal Clear"
We got back to the ship about 12:45, stopping in the cabin to see if I had any other ‘tool’ I could use on the camera. Giving up, I went up to the Lido about 1:15 for some lunch. I had some salad, hearts of palm, egg salad, bratwurst with sauerkraut & something that looked like lasagna (actually layers of roasted vegetables, cheese, spinach, tomato sauce & polenta used in the place of pasta noodles). Very good lunch. I read a little while & then started working on the photos. When I look at the difference in the quality of the photos shot with the Sony & the others with the Olympus ‘point & shoot’, it just makes me sick at my stomach. You will notice especially in the food shots from lunch & dinner. I cannot capture a whole month of southeast Asian memories on that thing. I’ve got to go camera shopping in Fremantle! I couldn’t let myself lie down & nap this afternoon; it’s a big night onboard for all us ‘Olympic athletes’. The opening ceremony for the 2012 World Cruise Games takes place tonight at 10:15 in the Galaxy Lounge. 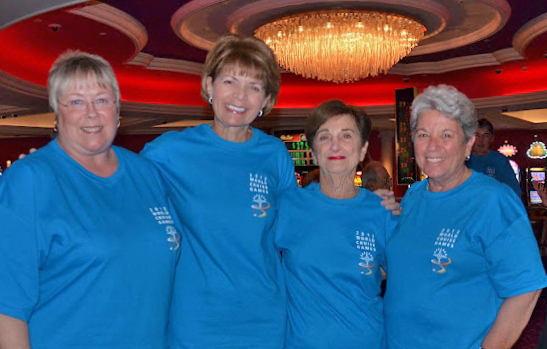 We are to put on our ‘world games’ tee shirts & assemble in the casino at 9:45. But first my in cabin dinner…..I had an appetizer of grilled eggplant salad garnished with endive leaves, cherry tomatoes & shaved parmesan cheese. My main course was a huge lump crab cake with roasted pepper & avocado relish, garlic aioli & crisp potato straws on top. I had a side order of Brussels sprouts. Much later I had a dessert which was actually one of the appetizers, “Mosaic of fresh fruit with Drambui Liqueur”. It had some of everything……New Zealand kiwi, strawberries, cherries, wedges of oranges, grapefruit & peaches atop thin slices of pineapple, honeydew & cantaloupe, pomegranate seeds, blueberries & toasted nuts. With Anne Marie, Elaine & Peggy prior to the opening ceremony. Thanks to Keith for letting me 'borrow' this photo. Now back to the opening ceremony……due to the late hour, I was concerned that there would be no one up to watch the parade of nations. The number of participants & the number of spectators were probably evenly matched. Quite a few crew members were in their white world game tee shirts; & they helped the passenger athletes carry the flags during the opening parade of nations. Liz (my darling cabin stewardess) was out to represent her home country of India. Most of the ‘athletes’ were lining up behind the U.S. flag; & there was a great shortage of people to carry the flags of other countries. So, I volunteered to carry the French flag (in honor of Daddy). Celebrity guests, Cathy Rigby & Peter Vidmar (U.S. Gold Medal winning gymnasts) were introduced at the end of the evening. It was all great fun; & tomorrow morning the competition gets underway. At 11 pm the Serenity quietly pushed away from the pier. It was quite chilly outside; so I didn’t stay out on the aft deck very long. Three sea days ahead, time to catch up on rest, photos & hopefully do some reading. Oh, I hate that camera died on you ! It was taking beautiful photos. I've had one Olympus that I loved but it was one of the first digitals. But now they drag and are slow (have alot of noise in the photos) I hope you find another Sony you love ... or check into the Lumix with Leica Lens...I promise it takes awesome photos. I won a photo contest with one of my Lumix pictures. Nobody ever new it wasn't my SLR. ha!! !